The jar that she withdrew had been prepared several months ago, which she knew mean that it was now very potent, well past the minimum dose practices that homeopathy advocated. Dr. Martin had told her to always have a belladonna solution prepared and ready, but to not let it sit for more than two months. He regularly sent her new herbs with which to prepare tinctures and she was usually faithful about making new ones, allowing them to mature for several weeks and then discarding the older solutions. During the last few months of Olivia’s pregnancy however she had skipped several of these rotations, believing that it may be necessary to have very strong medicines available as her daughter came to term. She had seen some very rough births over her many years and was determined to have remedies that could aid her daughter regardless of Olivia’s personal beliefs about the matter. She remembered the day that she had prepared this particular tincture, a stormy morning about three months ago. During its preparation she had told Olivia the story of the last time she actually needed to use a belladonna solution. It had been several years ago, the final time she had seen her brother Michael alive and shortly before she left Maine to follow Olivia to Hiawatha. He had arrived at her house complaining of a headache and several days later this had worsened enough to confine him to the only bed in the house. She had given this up to her brother after finding him writhing in pain on the floor of her sitting room. Up until that point he had been staying at the Price Hotel and visiting with his sister during the evenings, an arrangement that allowed him to prospect for business with the local Indian’s during the day. Michael fashioned himself an Indian trader although he had little to show for it after years of chasing various tribes around the eastern seaboard. Concerned about his increasing pain, and knowing that he frowned upon the medicine they had grown up with, Olivia’s mother had slipped the tincture into a cup of tea. Relief had followed, although Michael voiced his suspicion before he left about how his cure had been affected. She had hugged him goodbye and told him not to worry so much as he likely had just gotten over it by resting. Olivia listened intently to the story, although she interrupted several times to lament the time her mother was wasting preparing remedies with little proven benefit. Her mother had a lifetime of proof, some of it validated by cures affected on her daughter, although that seemed to matter little to Olivia. As she worked they alternated, the mother telling her story and the daughter lecturing on medical advances. She had prepared the solution so many times that she hardly looked down as she worked. 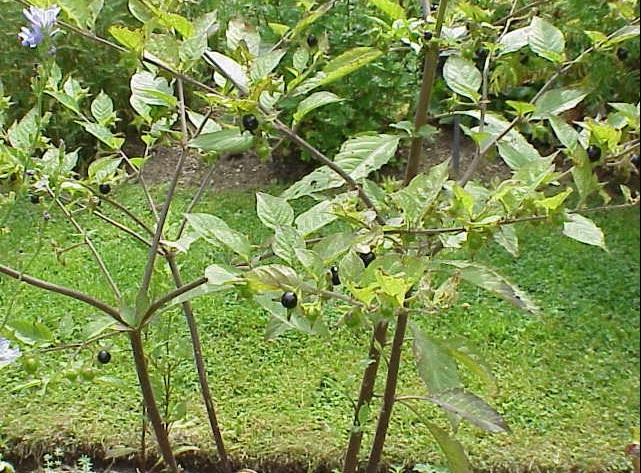 Taking a belladonna plant from the rough cloth bag she kept them in, she placed the entire dried stalk into the mortar, several of its neatly tapered leaves and faded purple flowers peeking above the rim. As she reached in and crushed it with her hand she could feel the brittle black berries as they broke off their stems. Reaching for the pestle, she ground the plant for several seconds, just enough to ensure it was broken up sufficiently to release all of its medicinal qualities. Once that was done, she placed the crushed pieces into a small jar and then filled it with grain alcohol, placing a small bolt of cheesecloth over the top before sealing it tightly with the lid. After that it was placed into that far corner of the cupboard where it rested and gained potency until it was needed. That time was certainly now, as Olivia’s cries continued and she could hear the bed banging on the floor as her daughter thrashed around. Unsealing the jar, she quickly tied a string around the cheesecloth to keep it attached to the opening, then decanted several tablespoons of the liquid into a tea cup. She was under no illusions that Olivia would drink a secret solution as her brother had, and the tincture was too strong for that in any event. Carrying a teaspoon and the cup, Olivia’s mother returned to the bedroom where she found her daughter standing at the foot of the bed, naked now but wrapped in a sweat-soaked sheet and wailing. No discernible words were being spoken, just anguished cries of pain. Setting down the spoon and cup, she slowly went over and guided her back, where she slipped a fresh nightgown over Olivia’s head and then helped her sit down on the bed. She waited a few minutes for her daughter to quiet down and then she recovered the cup and carefully scooped out a spoonful of the medicine. As she turned back, the wailing started again, fear flashing in Olivia’s reddened eyes and she shouted a refusal to cooperate. Her mother took advantage of her opened mouth, spilled the medicine under her tongue and then dropped the spoon so she could hold her daughter’s mouth closed with both hands. A struggle followed, one that was won by the mother when Olivia reluctantly choked down the solution of belladonna. Five minutes later she was much quieter and had stopped moaning, easing back onto her soaked pillow, which her mother quickly replaced. Just as Olivia was falling back asleep another dose was tipped under her tongue, and then her mother was finally able to attend to the infant. It was just past three a.m. when she went in for her hourly check on her daughter. Up to this point Olivia had been sleeping comfortably, her breathing shallow and unlabored. As she slowly eased the door of the bedroom open, Olivia’s mother could see that this was no longer the case. Her daughter was flinching in her sleep and sweating profusely, the pillow underneath her head already visibly stained and wet. A check with her hand on Olivia’s forehead confirmed that she had a fever. Despite her concern, Olivia’s mother sat down in the rocking chair next to the bed and thought for a few seconds about exactly what to do. She certainly had her own instincts about how to care for a person with a fever, however she also knew that her daughter thought much of that knowledge was longer valid. Perhaps there was some value in all of the new medical information in which Olivia believed. Her thoughts were interrupted by the faint cry of the infant from the other room, after which she noticed that Olivia had begun to toss and turn in her bed although she still seemed to be asleep. She also was starting to mutter words, unintelligible but increasing in volume. Deciding that there was no time for anything other than what she already knew, Olivia’s mother shook her daughter’s shoulder in an attempt to wake her up. She could feel the fever’s heat even through the heavy nightgown Olivia wore and the sweat was staring to soak through the garment. Unsuccessful in her initial attempts, Olivia’s mother started to slap her daughter’s face, lightly at first and then more sharply, until Olivia’s eyes suddenly snapped open, glistening and colored red, as she cried out in pain. Quickly her mother took her right hand and was shocked by how cool it was, a marked contrast to the high heat coming off of Olivia’s skin. She had seen this several times before and only hoped that the general delirium which often accompanied a fever such as this would not manifest itself in her daughter. This hope was quickly dashed as Olivia started to shake rather violently and cry out. Grabbing her daughter’s shoulders in an attempt to get the shaking to stop, the old woman mustered all of her power as she pushed Olivia back down toward the bed. When her head was finally back on the pillow she cried out again. Olivia’s eyes now fluttered open again, more red than before although they seemed focused and alert. Placing her hands over several parts of her daughter’s body, the mother realized that all of the body, except for the hands and feet, was extremely hot and starting to turn a pale pink. Olivia screamed. “No water! No water! You must not put the fire out! It burns me and warms my bones!” Closing her eyes again, she started to thrash around, repeating the words over and over again, her voice cracking as she screamed. Realizing that perhaps she had not seen such a serious case of a high fever as this one, her mother left her wailing and thrashing in bed and hurried to the kitchen. As she passed by her own room, the infant began to cry louder, a faint echo of Olivia’s screams. Reaching the kitchen, she quickly opened the cupboard nearest to the stove and removed the battered metal tin from the top shelf. Within this tin were the various components for the kind of medicines preferred by Olivia’s mother, the homeopathic remedies with which she had grown up and which were reinforced by Dr. Martin in his letters. Placing it down on the table, she lit the lamp on the table before returning to the cupboard. The cries of her daughter and granddaughter were increasing as they seemed to be locked in a competition to get her attention. The infant she knew was likely just hungry or wet and would need to wait until she tended to her daughter, for whom she was gravely concerned. Adjusting the lamp to burn more brightly, she reached back into the darkest corner of the cupboard and withdrew the tightly sealed jar that contained the belladonna tincture. The remaining days of her pregnancy passed for Olivia in what she would later recall as a dream-state, a seemingly endless series of similar days, marked by her mother’s repeated insistence that she remain in bed as much as possible. Dr. Martin was not mentioned by name, however Olivia suspected that some of the advice her mother was giving her had come through him. Although she rarely went outside during those days, she did still wait on the porch every day for Stan Waterman to hand her the daily mail, and she had seen several letters addressed to her mother in Dr. Martin’s heavy block printing. She of course did not know their content, and her mother did still seek personal medical advice from the man, however her belief was that he was prescribing her advice from afar. For that reason Olivia resisted much of what her mother advocated as the best course for her as she came to term, including her insistence that no doctor needed to be present at the delivery. They spoke about it for the last time just four days before Olivia gave birth. Her mother had begun by asking Olivia if she knew Mary Coswell, a midwife in the Hiawatha area who had a solid reputation both for delivering babies that lived and for taking good care of their mothers. At this Olivia glanced over and realized that her mother had, at some point in the conversation, picked up her Bible which she now had resting on her knees, one finger tapping the cover. Olivia looked away. The tapping on the Bible continued for ten more minutes, after which her mother rose and went into her bedroom, skipping their usual cup of tea before bed. Olivia smiled slightly to herself before rising to go to her own bedroom. It was the early morning four days after that conversation when she awoke, knowing that the time had arrived for her child to be born. She managed to get to the sideboard in the kitchen before the pain of a contraction caused her to yelp and lower herself to her knees. Several minutes later her mother had managed to pull her up and get her back into bed, after which she went to the neighbors house and asked Fran Dover to send her husband for the doctor. Olivia heard the whole conversation though the bedroom window, which faced the Dover’s kitchen, and gave her mother credit for honoring her wishes. 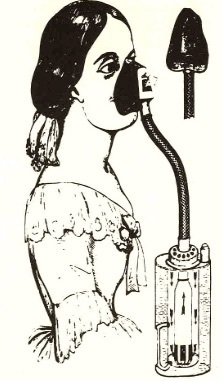 All went well and normally with the delivery, and while the administration of chloroform gas to her daughter via a strange looking medical device made Olivia’s mother very nervous, it did seem to take away most of her daughter’s pain. It also meant that she was not alert when the baby finally did arrive, which was a blessing as far as her mother was concerned. It took most of the energy she had to not break down into tears herself, and there was no doubt that Olivia would have been far worse. The baby was carefully cleaned and checked, then wrapped in a soft blanket and handed to Olivia’s mother, who rose quickly and carried the young girl out of the room. Placing it down onto her own bed she had the doctor assist her in moving the cradle Olivia had purchased, and once it was in her room she moved the baby to it and then softly sat down in a chair next to the cradle. She rested one hand on the edge and hummed under her breath, her eyes slowly filling with tears now that she was alone. She heard the doctor clattering around, picking up his things and speaking aloud to a still unconscious Olivia, giving medical guidance for her recovery. He had wanted to share it all with Olivia’s mother, however she had brushed him off after he assisted with the cradle, and now he apparently was at least not going to leave any of it unsaid. After finishing, he stopped again to ask Olivia’s mother is she had any questions, however she quietly replied that she knew how to take care of a woman after she gave birth. The doctor motioned toward the child however that was retuned only with a cold stare from the old woman so he left, banging the door too loudly on the way out. The night came and Olivia’s mother remained in the chair, silently crying.